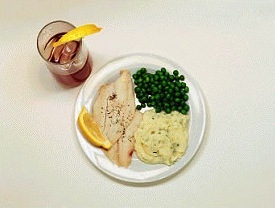 Need help visualizing appropriate portion sizes? This guide will help. See our recipe for power eggs here. See our low calorie eggplant parmesan recipe here. See our easy eggplant primavera recipe here. Think you can estimate calorie amounts? I can’t. It’s too hard. It’s one of the reasons why it is so hard to eat healthily. Most meals you buy out are far more calorie-dense that what you thought. If you don’t believe me – check out a standard Starbucks Hot Chocolate. It’s 440 Calories. Even you ask them to hold the whipped cream, it’s still 360 Calories. What happens when you combine that with a snack? Maybe a small chocolate croissant. Ouch! That’s another 340 Cals. Looking for some easy ways you can save a lot of calories in your everyday cooking? Learn how cook healthy. Most of these photos are from a doctor who had prepared a diet for his patients. He felt it was easier to show them the pictures. I think the doctor’s done great here. Although there are some items I don’t like. Low-fat butter? What is that? Reduced fat oil? I don’t like frankenfoods. Better to have the real thing, but in moderation. Did you spot some meals that didn’t quite fit? The ones with the colorful plate. They were made by one of our writers here – Ted. I think they are much more enticing than the doctor’s photos. You can see all his recipes here. I am looking for a diet for a female age 77 yrs. Little exercise as I have a back injury which does not allow it. I have already lost 80 lbs. Need to lose 50 more. What would my calorie intake need to be? Thanks, we’re glad you found it useful! You have provide good information about different food items. 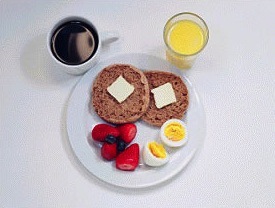 Mostly my breakfast is just like English Muffin Breakfast, now I know how much calories I take in my breakfast. Is there any calorie calculator.? Which calculate how much calories I consume in a day. Great! Glad you found the list useful. myfitnesspal has a good calorie tracker. Meh, your ideas about diabetes is based on old research. Newer studies have shown that diabetes is not caused by eating at all. You should visit my endocrinologist who specializes in diabetes. I was very surprised myself that most of his patients are quite thin since most people think diabetes is caused by overeating or eating carbs/sugar. “Studies of identical twins showed that twins have an 80% concordance for Type 2 Diabetes. In other words, if one twin has Type 2 Diabetes, the chance that the other will have it two are 4 out of 5. While you might assume that this might simply point to the fact that twins are raised in the same home by mothers who feed them the same unhealthy diets, studies of non-identical twins found NO such correlation. The chances that one non-identical twin might have Type 2 Diabetes if the other had it were much lower, though these non-identical twins, born at the same time and raised by the same caregivers were presumably also exposed to the same unhealthy diets.” – and other research shows that diabetes is actually genetic in origin. I think it’s true since if diabetes is caused by eating then every obese person you see would be diabetic. I need 1000 calories per meal. I eat 4 lbs of fruit, nuts, and veggies, drink 1/2 gallon of milk, and eat 1lb of meat a day. it may seem excessive to some but I am a marathon runner and power lifter. My BMI says I’m obese but I have less than 15% body fat. Sounds logical to me. I would just keep a close eye on your blood levels from consuming a lot of milk. Not sure what kind you drink and I’m all for a lot of fat in the diet but milk fat isn’t always the healthiest. After all, milk is designed by nature for growing baby cows. Yes, BMI isn’t a good measure of fitness at all and you are the perfect example. The paleo diet is very dangerous as is the atkins south beach etc anything that mainly concentrates on protein puts too much stress on the nephrons in the kidneys and is inflammatory in the body. 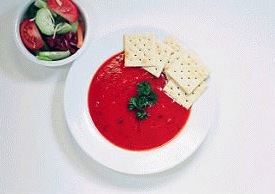 The emphasis should be on high coloured foods with lots of antioxidants. Your plate should be full of complex carbohydrates some fat and a small amount of protein…All this protein hype is finally hitting the wall…the emphasis on protein over the last 10 years has influenced the excessive amount of protein being consumed by millions of people worldwide. Increasing green house gasses cruelty to animal production etc…it is a well known scientific fact that people who eat protein as their staple live the shortest lives. Vegetarians live the longest and that is because our bodies are made to break down plant foods. Excessive protein has been linked with obesity and look at what is happening around the world with the emphasis of a high protein diet!! 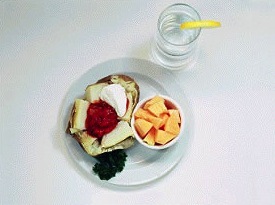 Get back to basics fruit veges and a little protein in moderation…stop putting steaks on the plate!! Maria, I would suggest that very high protein diets may not be healthful for certain people (but definitely not everybody). AS research continues, what we are seeing is that both diet AND exercise have remarkably different outcomes for different people. Probably one of my reservations about a high-meat diet is that it is simply not sustainable for planet earth, and the human race living on it. We cannot support everyone in the world gulping down piles of meat – or for the vanity of a wealthy elite who want to have big muscles. Hey Maria, Thanks for your thoughts! 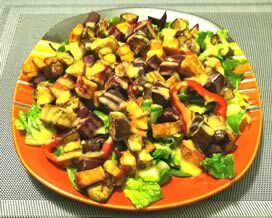 I’ve personally found, through research and experience, that Paleo style diets can be incredibly beneficial for health, physique and, in a lot of cases, curing auto-immunity issues and metabolic damage (http://robbwolf.com/paleo-testimonials/). Have you come across any studies or research claiming the opposite? Would love to check them out! Totally agree with you and James around the enviromental affects of high meat consumption, though. We definitely need to re-think our current strategy as it seems unsustainable. 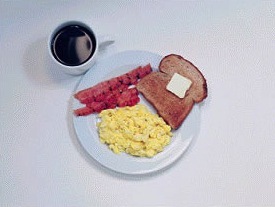 This is my brunch on those weekend days that I sleep in. This equals about 361 calories. 2 Nutrigrain whole grain eggos, 1 tbsp of organic peanut butter, 4 egg whites and a cup of strawberries. That really is a lot of food. I always thought you could only eat tons of veg. to keep cals. low. That’s why I’m here. I’m all for veg but come on, I need to eat more of the other macros. Now I want some whole grain eggos. Awesome, and you are right about the satiety factor. 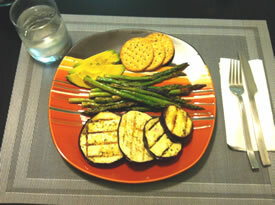 If you ever feel like making any meals like this and sending the photo to us – we would LOVE to put it up on this page. Is that why you deleted my entry with an appropriate meal that included avocado, tomato, and egg? No Wendy, we didn’t delete anything from you and welcome other suggestions and alternatives as well as respect your opinion 🙂 Could you post it again please? Glad you didn’t delete my comment. No need to post the URL. I don’t make money off my website so it is not a promotional thing for me to recommend the menu ideas. We are happy to post useful links and yours is. Nice blog btw 🙂 We’ll check the settings to make sure great comments like yours don’t slip through the cracks. I’m glad you said something. 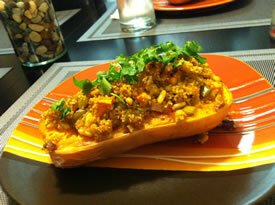 Do you want to send us a couple pictures and descriptions of 300 calorie paleo meals? We’ll include them above and link to your site as attribution. I actually just found your post in the spam folder. It was flagged automatically because of the link. I thought many of these meals were too high in carbs and woulld lead to blood sugar spikes and hunger. The frankenfoods need to go too. Noted (and interesting that most of these were from a doctor helping his patients). Would love to see any ideas. 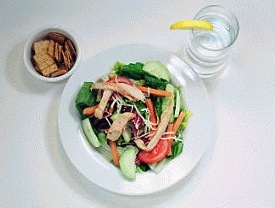 What’s your favorite low-calorie meal? I would tend to disagree. The only thing that would be a “frankenfood” would be the turkey bacon and most of the carbs featured are complex and wouldn’t spike blood sugar. The oils that are manufactured are all frankenfoods. The bread that is bromated is frankenfood as well. But I really don’t have the energy to argue with you. The truth will become evident within the next 20 years and is already showing up in research. No worries on my end. You’ll get no argument from me. I only eat coconut oil and butter for the most part and do try to avoid foods with those oils more for their inflammatory properties than anything else. I also seldom eat breads. 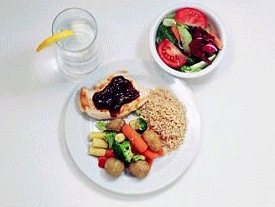 However, the meals above are a good start for someone new to eating healthy and portion control. 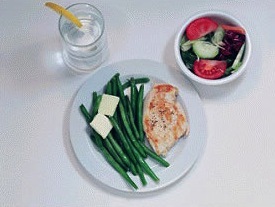 I personally didn’t eat healthier overnight, but gradually made more healthy changes to my diet as I went along. Was it the same for you? That is what most internet “experts” say yet I have found this to be not true. have diabetes and check my blood sugar before and after meals. The type amd amount of carbs shown here (one bagel, two slices of bread, half a cup of rice) do not make my blood sugar spike at all. I’ll go with what my doctor told me (almost exactly like these photos) since it does totally work. some of the breakfast items aren’t accurate? 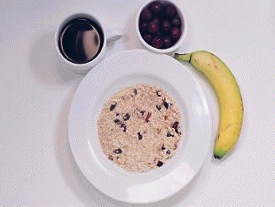 I would like to believe this if how much a person can eat, but 1 cup oatmeal alone (without raisins) is 300 cal. Am i wrong, i would like to know so that im not worrying over what i eat. oats, instant, fortified, with raisins and spice, prepared with water = 211 Calories per cup (so remember this is 1 cup of COOKED oats). 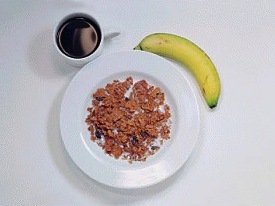 Add in a banana – around 100 Cals (https://www.freedieting.com/tools/calories_in_a_banana.htm) and we have around 310. Plus half a cup of say blueberries = 40 cals. Oh so your saying dried oats with raisins and spice, all in one adds up to 211. But if you had I cup of dried oats alone, what would that be? I think I’m starting to understand a little more. I just need a little more clarification. Ted – what’s your source? Ok I think I figured out the error. The USDA database is saying that 1 cup of dry rolled oats is 156 grams. A cup is a measurement of volume and grams is a measurement of mass these are not interchangeable nor standardized. 1 cup of quick rolled oats is more like 80 grams because it is light and fluffy which takes up more space with less mass involved. It also makes a difference whether it’s instant, quick, regular rolled oats, or steel cut when it comes to measuring calories using “cups” All these methods change the volume/mass ratio. Ya! That’s what I was thinking. I eat oats every morning, and just HALF a cup of dried oats once cooked greatly increases in volume. I need a rather large bowl to eat my half cup. However the sachets you can buy are a smaller amount than this. Great Thanks!!! This helped so much. I’ve stretched my stomach maybe a little to much due to an illness and I eat 1 cup dried oats cooked and still have hunger pains after that. Its so hard to find low calorie meals that give me that full but not to full satisfaction. I was confused by this, too! One cup of (uncooked) oatmeal when its cooked is like one huge bowl of cooked oatmeal since it absorbs water a lot. Cooked and uncooked have to be measured differently. Here’s one of my favorites, chicken with veggie “noodles” (julienne cut veggies) in peanut sauce (peanut butter thinned with water, add soy sauce and seasonings). can I get this recipe?? It looks wonderful!!! Hi Tanjie, it’s one of my own creations in the kitchen, and I like to keep it simple. I’ve been practicing the anti-inflamatory Zone Diet and lifestyle for close to twenty years and all of my meals are designed based on Zone principles. To make this recipe, sauté bite sized pieces of skinless chicken breast in a very small amount of olive oil, (adding a little water helps to prevent sticking). In another skillet sauté julienne cut yellow summer squash, zucchini, red bell peppers and yellow bell peppers in a little water, not for too long, you want them to retain a little crispness. In a small bowl thin 2 teaspoons of peanut butter with water to create a sauce consistency, add soy sauce (I use Bragg’s Liquid Aminos, it’s like soy sauce), onion powder, garlic powder and a few pinches of cayenne pepper to taste. 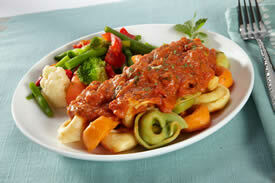 Combine the chicken with the veggies and sauce, and heat on the stove top for another minute or two. Serve immediately. Thankyou for that lovely recipe going to make tomorow!! Krusteaz has these great fat free muffin mixes with 130 calories a muffin. All you do is add water, mix, and bake. If you just must have the hot chocolate that could go with it. 130 Cals is certainly less than your typical muffin – but I worry what’s in some of baking mixes. I think this is a great idea. I think it’s so much easier for people to look at a picture and duplicate the portion size at home than to read something and try to interpret it the way they think it should be. 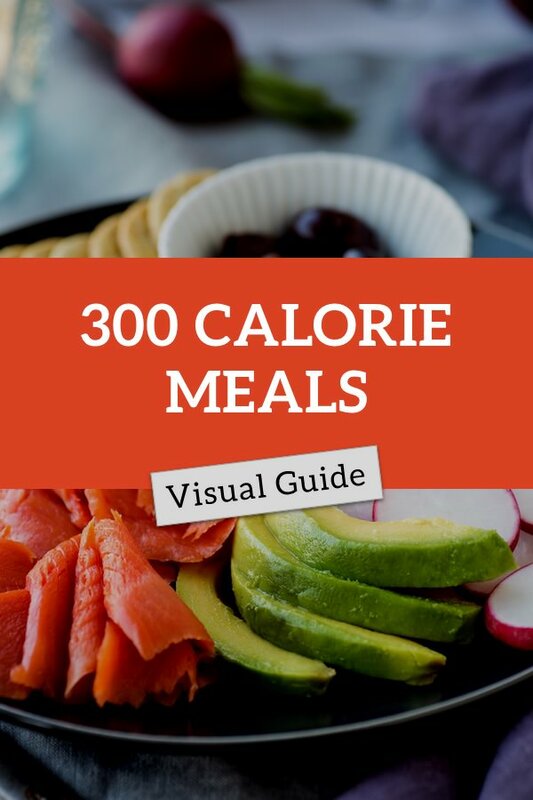 It also shows people how much food you can get if you load up on veggies–I’d much rather have that roasted veggie salad than a calorie-filled Frappuccino. One of my favorite go-to lunches that is around 300 calories is a quinoa salad—I mix cooked quinoa with halved cherry tomatoes, diced chicken breast, spinach, and mushrooms and toss it with a light vinaigrette. I don’t have a picture of what a 300 calorie portion is, but it’s pretty satisfying. Next time you have that quinoa salad (which sounds really tasty), take a photo of it and upload (the disqus comments system allows uploading of images in the comments). ps pictures are not appearing? Sorry! Teething problems with the new site. Should be showing now. That’s why I mentioned it. Figured you might not realize. They are there now, looking good! Good luck with the new venture. – the air in the butter makes it lower-calorie. I think.